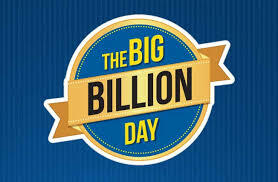 All you know What is Big Billion Day.Flipkart has announced a Big Billion day for amazing sales.last year 6 October,2014 Many users are missed the most advantage deals under this Big Billion Day Sales.This Year Flipkart has returned with biggest sales.These BigBillion Sales will live on 13th October,2015 to 17th October,2015 on Mobile Apps (Android/iphones/windows).Just See All Details about this flipkart biggest sale. Addition 10% Off On Using Specific Bank DC/CC : Extra 10% Discount on Purchasing Products with SBI BANK DC/CC,CITY BANK DD/CC,YES BANK DC/CC,STANDARD CHARTERED CARDS. Simple and Quick Ways To Grab Any Deals Fast : All of you know this is a sale many products goes out of stock in few minutes.Here i am giving you some tips for grab deals fast under Big billion Day Offer. 1.This offer will live in mobile apps so Download flipkart apps in your mobile before sales start. 2.Many Users have slow speed internet connection.Always use 3g/Wifi/Broadband connection to grab any deals in few seconds. 3.Many Users have no account in shopping sites,Make it before Sales Starts. 4.Don't waste your time to choose products at time of sales.Before Sales Start Go to Flipkart and choose products what you want to buy and create a wishlist of that products so that on Big Billion Sale you can see discount of that product and can fastly grab it. 5.Ready your shipping address before sales starts.Go to setting section under your account.Now on shipping details fill your address details right now. 6.On Payment page when you entering your DD/CC number may be deals goes to out of stock so for safety Save your card details before selling starts. 7.That's it! Now Wait for 13th October Big Billion Sale for your dreamy products.